Last night we delivered and set-up our craft table at our local Curves. Erin separated each of her 42 jars of pre-orders into boxes for each person with an itemized receipt. For those who ordered $40 or more she threw in a Cocoa Heaven for Two. 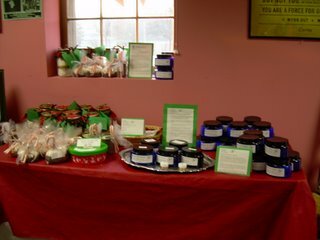 On Saturday we (all the kids helped with this) also prepared many jars of salts and scrubs. Add to that the lip balm and our table was pretty full! On the silver tray are testers (hopefully people will limit their opening of jars to those). We put together little stand-up flyers that tell people about the products and under the table there is some extra inventory. We'll see how it goes for the rest of the week and then next week is our Craft House.